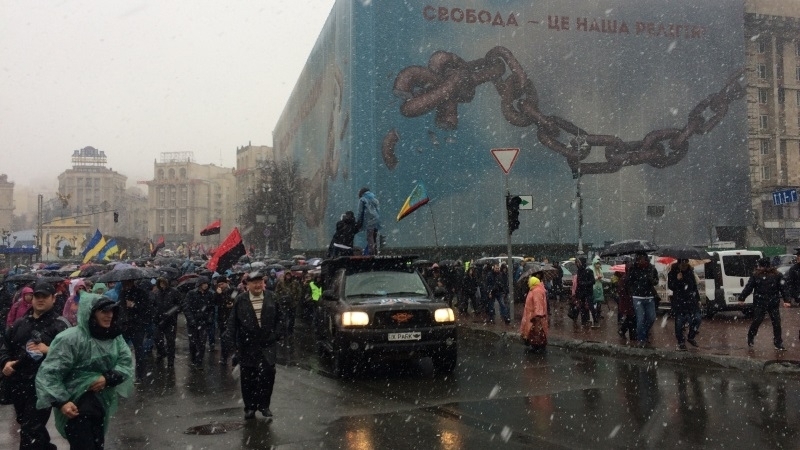 November 12, participants in the March of the Indignant gathered at Mikhailovskaya Square of the Ukrainian capital. The event was announced by the leader of the party Movement of New Forces , ex-head of Odesa Regional State Administration Mikheil Saakashvili. On the square, several hundred people gathered with the flags of Ukraine and the "Right Sector". Saakashvili's ally David Sakvarelidze said that the protesters demanded to pass a law on impeachment and create an anti-corruption court. “Give them [the authorities, - Ed.] time until December 3. If they do not accept it, we collect people and declare "people's impeachment," he said. Among the participants were also Saakashvili's spouse, People's Deputies Yury Derevyanko, Yury Levchenko, Serhiy Leshchenko. During the event on the Mikhailovsky Square order was provided by several hundred special forces representatives from the side of Velika Zhitomirska street. Reference: the State Migration Service refused to recognize Saakashvili as a refugee in Ukraine. On November 4, Saakashvili paid a fine of UAH 3.4 thousand for illegally crossing the border. Erlier, the General Prosecutor's Office of Ukraine summoned Derevianko, an ally of Saakashvili, for interrogation.